Maybe this is the news that everyone has been waiting for in the Bermuda Triangle …. According to an oceanographer, the technology that lies hidden beneath the ocean in the Bermuda Triangle is anything but ordinary and most likely not originated on Earth. This mysterious area is full of incredible stories related to entities from other world and rumors of supernatural things happening in the place. Is it possible that this imaginary triangle is evidence of extraterrestrial activity on our planet? One thing is certain, over the last century, the Bermuda Triangle has “swallowed” ships and planes that disappear without leaving traces taking hundreds of lives. Two giant mesmerizing pyramids made of some sort of thick glass were discovered in the center of the Bermuda Triangle. The technology that lies beneath the vast ocean is a mystery to modern science. The anomalous structures located at a depth of 2,000 meters were identified by Dr. Meyer, a German oceanographer and his team using sonar equipment. According to reports, the army stopped all future research ..
Meyer firmly believes that the discovery of strange pyramidal structures in the center of the triangle could shed light on the mysterious disappearances of ships and planes associated with the Bermuda Triangle. According to several reports the number of mysteries around the pyramids is something that no one has been able to answer. The pyramids located in the triangle are made of some type of crystal that could be one of the main reasons why the area had anomalous disappearances. Oceanographers claim to have found the anomalous structures more than 20 years ago, concluding that the surface of the structures was flat, suggesting that they were made of glass or some type of crystal. The alleged pyramids, which no one was able to photograph, appear to be up to three times the size of the Great Pyramid of Giza. Today, the truth about the existence or nonexistence of pyramids is found only in the hands of military and government agencies that have safely obliterated all data related to anomalous structures. Many believe that the anomalies of the Bermuda Triangle are caused by the existence of extraterrestrial technology in the region, perhaps in the same way that the Baltic Sea UFO (or Baltic Sea Anomaly) damages several devices, perhaps these pyramids cause the same effects on ships and Airplanes … Most likely this ancient advanced technology is hidden over our oceans that have been little explored. 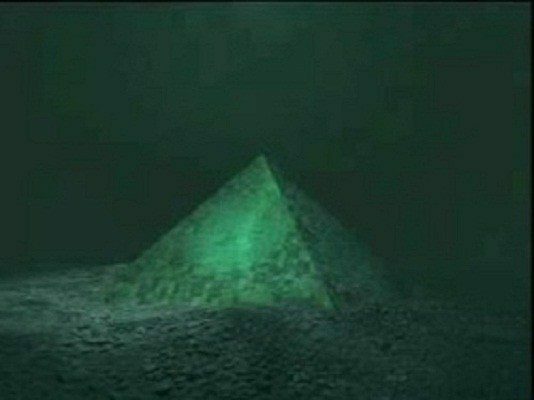 Today, we can not accept or deny the findings of the alleged German Oceanographer whose research on underwater pyramids was allegedly confiscated by the military. We can not confirm their identity, their existence, nor can we say whether the expedition in search of the pyramids has already occurred. The only thing we can say is that the Bermuda Triangle has a long history full of mysteries that no one could explain with precision.